Experimental autoimmune encephalomyelitis (EAE) is a rodent model of multiple sclerosis (MS), a debilitating autoimmune disease of the CNS, for which only limited therapeutic interventions are available. Because MS is mediated in part by autoreactive T cells, particularly Th17 and Th1 cells, in the current study, we tested whether inhibitors of glycogen synthase kinase-3 (GSK3), previously reported to reduce Th17 cell generation, also alter Th1 cell production or alleviate EAE. GSK3 inhibitors were found to impede the production of Th1 cells by reducing STAT1 activation. Molecularly reducing the expression of either of the two GSK3 isoforms demonstrated that Th17 cell production was sensitive to reduced levels of GSK3β and Th1 cell production was inhibited in GSK3α-deficient cells. 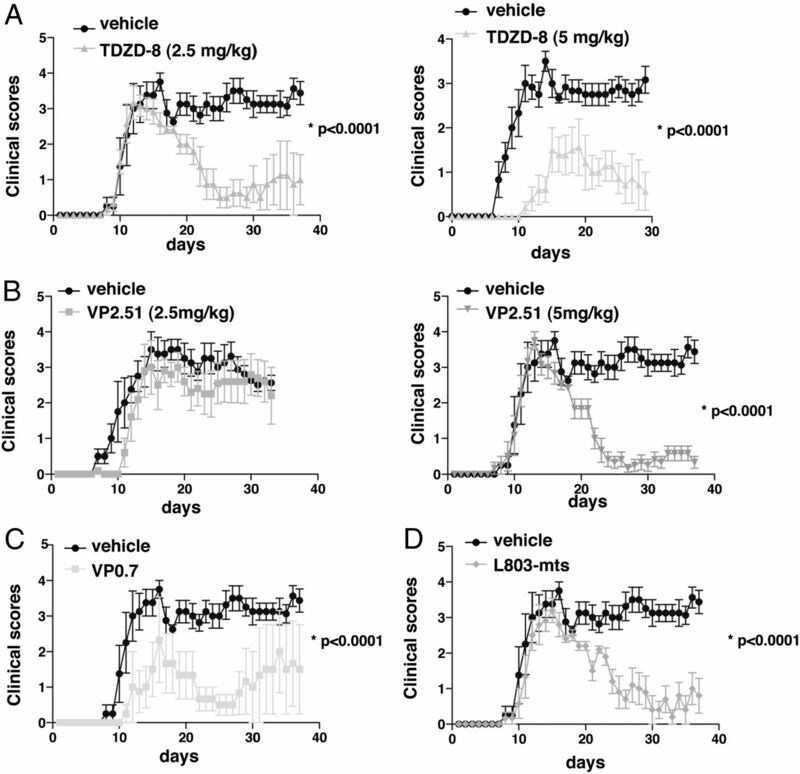 Administration of the selective GSK3 inhibitors TDZD-8, VP2.51, VP0.7, or L803-mts significantly reduced the clinical symptoms of myelin oligodendrocyte glycoprotein35–55-induced EAE in mice, nearly eliminating the chronic progressive phase, and reduced the number of Th17 and Th1 cells in the spinal cord. Administration of TDZD-8 or L803-mts after the initial disease episode alleviated clinical symptoms in a relapsing-remitting model of proteolipid protein139–151-induced EAE. Furthermore, deletion of GSK3β specifically in T cells was sufficient to alleviate myelin oligodendrocyte glycoprotein35–55-induced EAE. These results demonstrate the isoform-selective effects of GSK3 on T cell generation and the therapeutic effects of GSK3 inhibitors in EAE, as well as showing that GSK3 inhibition in T cells is sufficient to reduce the severity of EAE, suggesting that GSK3 may be a feasible target for developing new therapeutic interventions for MS. Multiple sclerosis (MS) is the most common inflammatory demyelinating disease of the CNS (1, 2). Most patients exhibit an initial relapsing-remitting course of the disease that is followed by progressive MS that causes severe neurologic disability. Current therapies have limited benefits and often significant side effects (3, 4). Thus the need for new therapeutic targets for MS is crucial, particularly for the debilitating progressive phase, which may be identified in animal models of MS. The most widely used animal model of MS is experimental autoimmune encephalomyelitis (EAE) (5, 6). EAE is induced in susceptible rodents by immunization with myelin Ags, such as myelin oligodendrocyte glycoprotein peptide35–55 (MOG35–55) and proteolipid protein peptide139–151 (PLP139–151), which produce disease symptoms with many similarities to those of MS (7). The cause of MS is not fully understood, but it is widely considered to involve impaired neural function resulting from a complex interaction of neuroinflammation and autoimmune reactions mediated by autoreactive T cells (1, 2). Particularly implicated in MS and EAE disease states are actions of Th1 cells, characterized by their production of IFN-γ and expression of Tbet, and of IL-17–producing, retinoid-related orphan receptor γ T–expressing Th17 cells, as well as diminished actions of immunosuppressive and anti-inflammatory regulatory T cells (Tregs), characterized by the production of IL-10 and expression of Foxp3 (8, 9). Among the known mechanisms regulating these T cell subsets is the requirement for glycogen synthase kinase-3 (GSK3) in the production of Th17 cells (10). Of the two GSK3 isoforms, GSK3α and GSK3β, the level of GSK3β is particularly increased during the differentiation of Th17 cells, and GSK3 inhibitors block Th17 differentiation by inhibiting IL-6 production and STAT3 activation in response to IL-6 (10). Still to be determined is whether GSK3 also regulates the production of other T cell subtypes, which is addressed in this article. Administration of the GSK3 inhibitor lithium blocks the onset of MOG- and PLP-induced EAE in mice, and blocks the relapse of PLP-induced relapsing-remitting EAE when given after the first episode (10, 11). Lithium treatment in vitro and/or in vivo has been shown to be beneficial for many of the critical pathologic mechanisms in MS, including being an effective anti-inflammatory agent (12), blocking Th17 cell production (10), providing neuroprotection against a wide range of insults (13, 14), and promoting remyelination (15). Although lithium is a promising therapeutic agent for MS and is safely used as a mood stabilizer in patients with bipolar disorder, it has a low therapeutic index, can cause side effects at serum levels modestly above the therapeutic level, and may not be well tolerated in disabled patients (16). Therefore, it would be beneficial to identify the therapeutic target of lithium in EAE to pinpoint specific, efficacious inhibitors of the target for MS therapy. Much evidence indicates that inhibition of GSK3 is a critical therapeutic action of lithium in other diseases, and known actions of GSK3 suggest it is likely the therapeutic target of lithium in EAE. In this regard, inflammation is increased by GSK3 (17), the production of Th17 cells requires active GSK3 (10), neuronal apoptosis induced by many insults is enhanced by GSK3 (14), and GSK3 impairs myelination (15). These actions of GSK3 suggest that inhibition of GSK3 is likely an important component of the therapeutic effects of lithium in EAE, raising the possibility that GSK3 may be a target for the development of new treatments for EAE and MS. In the current study, we tested whether inhibition of GSK3 influences the production of T cell subtypes in addition to Th17 cells, and whether specific inhibition of GSK3 controls EAE. For EAE, we used a structurally and functionally diverse panel of small molecules that specifically inhibit both GSK3α and GSK3β. TDZD-8 is a highly selective ATP noncompetitive inhibitor of GSK3 (IC50 = 2 μM) (18) that is effective in vivo in rodents (19–26), and a TDZD-8 derivative, called NP-12 or tideglusib, is undergoing clinical trials in patients with Alzheimer's disease (27). We also tested L803-mts, a cell-permeable 11-residue peptide substrate-competitive specific inhibitor of GSK3 that has protective actions in neurons and is effective in vivo in mice (15, 28–33). Two new GSK3 inhibitors were also examined. VP2.51 is a potent (IC50 = 400 nM), highly selective ATP-competitive inhibitor of GSK3 that was recently shown to have neurogenic properties (34). VP0.7 (IC50 = 3 μM) is an allosteric (not competitive with ATP or substrate) selective GSK3 inhibitor that binds to the C-terminal lobe of the enzyme (35). 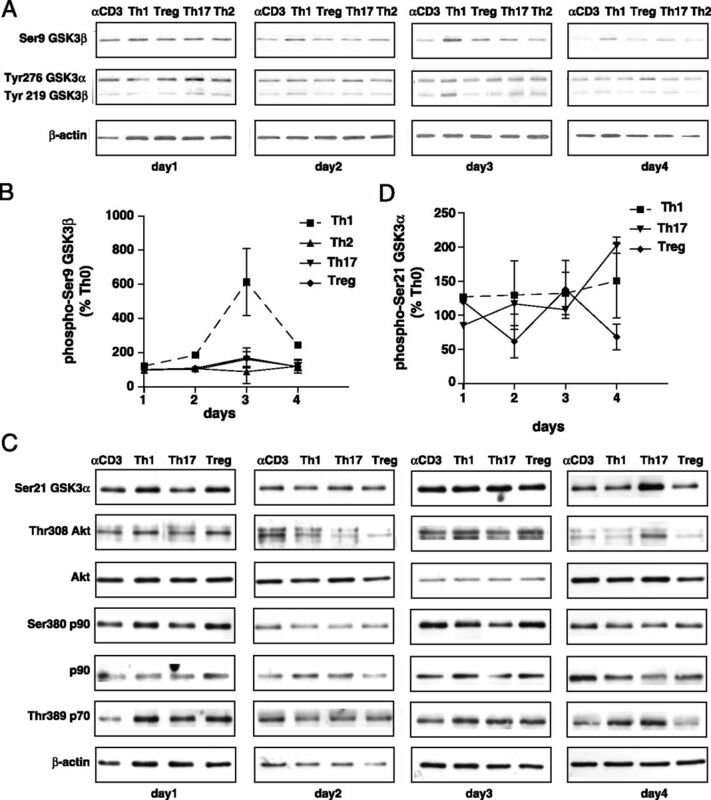 To begin to identify specific cell types in which GSK3 contributes to the development of EAE, we tested whether deletion of GSK3β specifically in T cells is sufficient to alleviate EAE based on the evidence that GSK3 promotes Th17 cell production and EAE, and that the expression of GSK3β is particularly upregulated in Th17 cells (10). The results show that GSK3 inhibitors reduce Th1 cells, as well as the production of Th17 cells; that GSK3 inhibitors protect from EAE, especially the chronic progressive phase that is most debilitating in MS; and that deletion of GSK3β from T cells is sufficient to protect from EAE. Male C57BL/6 and female SJL/J (6–8 wk) mice were purchased from the The Jackson Laboratory, GSK3S21A/S21A/S9A/S9A knockin mice were provided by Dr. D. Alessi (University of Dundee, Dundee, U.K.), and GSK3α knockout and GSK3β+/− heterozygote mice were bred in the Woodgett laboratory. GSK3β was specifically knocked down in T cells by crossing GSK3βFlox/Flox mice (36, 37) and CD4-CRE mice (Taconic), to obtain GSK3βFlox/Flox-CD4-CRE mice and their littermate control GSK3βFlox/Flox mice. Mice were housed in light- and temperature-controlled rooms and treated in accordance with National Institutes of Health, University of Miami, University of Alabama at Birmingham, and Samuel Lunenfeld Research Institute Institutional Animal Care and Use Committee regulations. Spleens and lymph nodes were collected, and single-cell suspensions were prepared by mechanical disruption in RPMI 1640 medium supplemented with 10% FBS, 100 IU/ml penicillin, 100 μg/ml streptomycin, 1 × nonessential amino acids, 1 μM sodium pyruvate, 2.5 μM 2-ME, and 2 mM L-glutamine (R-10). CD4+ T cells were isolated by magnetic sorting with Dynabeads mouse CD4+ beads according to the manufacturer’s instructions (Invitrogen). Irradiated (3000 rads) splenic feeder cells were used as APCs and were cultured with purified CD4+ T cells at a ratio of 5:1. CD4+ T cells were activated with 2.5 μg/ml anti-CD3 (clone 145-11). Th1 cells were differentiated by addition of IL-12 (10 ng/ml; R&D Systems) and anti–IL-4 (10 μg/ml; clone 11B11). Th2 cells were differentiated by addition of IL-4 (1000 U/ml; Peprotech), anti–IFN-γ (10 μg/ml; clone XMG1.2), and anti–IL-12 (10 μg/ml; clone C17.8). Th17 cells were differentiated by addition of IL-6 (20 ng/ml; Peprotech), TGF-β (5 ng/ml; Peprotech), anti–IL-4 (10 μg/ml; clone 11B11), and anti–IFN-γ (10 μg/ml; clone XMG1.2). Tregs were differentiated by addition of TGF-β (5 ng/ml), anti–IL-4 (10 μg/ml; clone 11B11), and anti–IFN-γ (10 μg/ml; clone XMG1.2). Where indicated, cultures were supplemented with GSK3 inhibitors, including 1 μM TDZD-8 (produced in the Martinez laboratory), 10 mM LiCl (Sigma-Aldrich), or 1 μM CHIR99021 (University of Dundee). CD4+ T cells were collected and were stimulated for 4 h with PMA (50 ng/ml; Alexis) and ionomycin (750 ng/ml; Sigma-Aldrich) in the presence of GolgiPlug (IFN-γ and IL-17) at the recommended concentrations (BD Pharmingen). Standard intracellular cytokine staining was carried out as described (38). Cells were first stained extracellularly with APC–conjugated anti-CD4 (eBioscience) and, where indicated, with a LIVE/DEAD dye (Invitrogen); fixed and permeabilized with permeabilization solution (eBioscience); and then stained intracellularly with eFluor 450–conjugated anti–IFN-γ, PE-conjugated anti–IL-17A, PE-conjugated anti–IL-10, PE-conjugated anti–IL-4, PerCP-conjugated anti-Tbet, or FITC-Foxp3 (eBioscience). Samples were acquired on an LSRII (BD), and data were analyzed with FlowJo software (TreeStar). Western blots were carried out as described previously (39), using Abs to phospho-Tyr701-STAT1, total STAT1, phospho-Tyr694-STAT4, total STAT4, phospho-Ser9-GSK3β, phospho-Ser21-GSK3α, phospho-Thr308 Akt, total Akt, phospho-Ser380-p90Rsk, total p90Rsk, phospho-Thr389-p70S6K (Cell Signaling Technology), phospho-Tyr276/Tyr219-GSK3α/β, total GSK3α/β (Millipore), and β-actin (Sigma-Aldrich). Purified CD4+ T cells were differentiated toward Th1 or Th17 for 3 d, and RNA was isolated by TRIzol extraction (Invitrogen). RNA was retrotranscribed using ImProm-II Reverse Transcriptase (Promega) according to the manufacturer’s instructions. Quantitative RT-PCR was carried out using a TaqMan with gene expression assay primers for GSK3β and β2-microglobulin according to the manufacturer’s instruction. CD4+ T cells were suspended at a density of 107 cells per milliliter in PBS. CFSE (Molecular Probes) diluted in PBS was added to an equal volume of prewarmed cell suspension at a final concentration of 5 μM, and the suspension was mixed rapidly. Cells were incubated at room temperature for 7 min, and the reaction was stopped with FBS. Cells were centrifuged and resuspended in culture medium. Mice were treated i.p. with 2.5 or 5 mg/kg TDZD-8, 2.5 or 5 mg/kg VP2.51, or 5 mg/kg VP0.7, 3 d prior to immunization and daily throughout the experiment. L803-mts (60 μg) was administered intranasally for 7 d before immunization, and after immunization 80 μg was given three times a week. For postimmunization treatments, drugs were administered at the same doses beginning on the indicated day, and treatment was continued throughout the experiment. TDZD-8, VP2.51, VP0.7, and L803-mts were synthesized following described procedures at Instituto Quimica Medica–Consejo Superior de Investigaciones Científicas (Madrid, Spain) and Tel Aviv University (Tel Aviv, Israel). EAE was induced in male C57BL/6 mice, or female GSK3βFlox/Flox-CD4-CRE mice and their littermate female control GSK3βFlox/Flox mice, with s.c. injection of 50 μg MOG35–55, or in female SJL/J mice with s.c. injection of 135 μg PLP139–151 peptide, in CFA containing 1.5 mg/ml heat-killed Mycobacterium tuberculosis H37Ra (Difco Laboratories). On the day of immunization and 48 h later, mice were injected i.p. with 50 ng pertussis toxin in PBS. Mice were examined daily for clinical signs of EAE. Mice were assigned clinical symptom scores as follows: 0, no paralysis; 1, loss of tail tone; 2, flaccid tail; 3, incomplete paralysis of one or two hind legs; 4, complete hind limb paralysis; 5, moribund (animals were humanely euthanized); 6, death. To compare the time course of disease development in different groups of mice, the daily average of the clinical scores was calculated for each group. Initially, we examined whether the upregulation of GSK3 reported during differentiation of Th17 cells (10) is T cell subtype selective by testing whether GSK3α or GSK3β protein levels changed during 4 d of polarization to Th1, Th2, Th17, or Treg cells. Th1 cells were induced by treatment of CD4+ T cells with 10 ng/ml IL-12, Th2 cells by treatment with IL-4, and Tregs by treatment with TGF-β, and the levels of GSK3 were compared with Th17 cells induced by treatment with TGF-β and IL-6 (Fig. 1A). Polarization to Th1 cells was accompanied by a large increase in the level of GSK3β that was comparable to the previously reported increase in Th17 cells (10), whereas the GSK3β protein level was not changed by polarization to Th2 cells or Tregs (Fig. 1B, 1C). The level of GSK3α was relatively stable during polarization to T cell subtypes, compared with the large changes in GSK3β (Fig. 1C). Quantitative RT-PCR analyses demonstrated increased GSK3β mRNA levels during polarization to Th1 and Th17 cells (Fig. 1D). We tested whether the increased expression of GSK3β in Th1 and Th17 cells is associated with changes in the regulatory phosphorylation of GSK3β, which is inhibited by phosphorylation on Ser9 and active when phosphorylated on Tyr216. Phosphorylated Ser9-GSK3β transiently increased after 3 d of differentiation to Th1 cells, but no changes in phospho-Ser9-GSK3β were evident during polarization to Th2 cells, Th17 cells, or Tregs. No differences were observed among the Th cell subsets in the tyrosine phosphorylation of GSK3β, except for a transient increase in Th1 cells after 3 d (Fig. 2A, 2B). No large differences were found among Th cell subsets in the Ser21 phosphorylation of GSK3α (Fig. 2C, 2D). We tested whether the transiently increased Ser9-GSK3β in Th1 cells was associated with increased activating phosphorylation of several of the kinases able to phosphorylate this site. Akt activation indicated by increased phospho-Thr308 was evident transiently after 3 d of polarization toward Th1, suggesting that this may underlie the increased GSK3β serine phosphorylation, but Akt also was activated in Tregs, which did not display increased phospho-Ser9-GSK3β (Fig. 2C). Phosphorylated p90 did not change in parallel with phospho-Ser9-GSK3β in Th1 cells, and although phosphorylated p70 was elevated in Th1 cells after 3 d of polarization, the time course of its changes did not parallel those of phospho-Ser9-GSK3β. 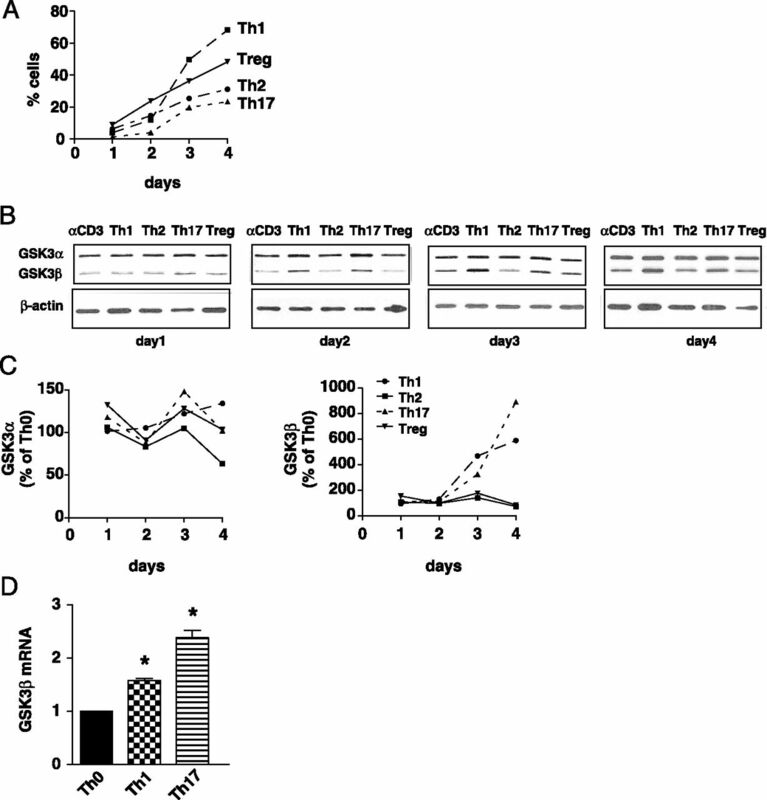 GSK3β expression increases during Th1 and Th17 cell differentiation. CD4+ T cells were cultured on irradiated lymph node cells and splenocytes in medium supplemented with 10 ng/ml IL-12, 10 μg/ml anti–IL-4, and 2.5 μg/ml anti-CD3 for Th1 cells; with 1000 U/ml IL-4, 10 μg/ml anti–IL-12, 10 μg/ml anti–IFN-γ, and 2.5 μg/ml anti-CD3 for Th2 cells; with 20 ng/ml IL-6 and 5 ng/ml TGF-β, 10 μg/ml anti–IL-4, 10 μg/ml anti–IFN-γ, and 2.5 μg/ml anti-CD3 for Th17 cells; and with 5 ng/ml TGF-β, 10 μg/ml anti–IL-4, 10 μg/ml anti–IFN-γ, and 2.5 μg/ml anti-CD3 for Tregs. After 1, 2, 3, and 4 d of differentiation, CD4+ T cells were restimulated for 4 h with ionomycin/PMA for flow cytometry analysis or harvested for immunoblotting. (A) Results of flow cytometry analysis of CD4+ T cell subtypes. Th17 cells were stained for IL-17A, Th1 for IFN-γ, Th2 for IL-4, and Treg for Foxp3. Cells were gated on CD4+ cells. (B) GSK3α and GSK3β protein levels were analyzed by immunoblotting, as shown in representative blots from one of three independent experiments, and (C) quantitative analyses of immunoblots. Immunoblots were reblotted with β-actin. (D) CD4+ T cells were polarized toward Th1 cells or Th17 cells for 3 d, and GSK3β mRNA levels were measured. Data are mean ± SEM. n = 3. *p < 0.05 as determined by ANOVA. Phosphorylation of signaling proteins. CD4+ T cells were cultured on irradiated lymph node cells and splenocytes in medium supplemented with 10 ng/ml IL-12, 10 μg/ml anti–IL-4, and 2.5 μg/ml anti-CD3 for Th1 cells; with 1000 U/ml IL-4, 10 μg/ml anti–IL-12, 10 μg/ml anti–IFN-γ, and 2.5 μg/ml anti-CD3 for Th2 cells; with 20 ng/ml IL-6 and 5 ng/ml TGF-β, 10 μg/ml anti–IL-4, 10 μg/ml anti–IFN-γ, and 2.5 μg/ml anti-CD3 for Th17 cells; and with 5 ng/ml TGFβ, 10 μg/ml anti-IL-4, 10 μg/ml anti-IFNγ and 2.5 μg/ml anti-CD3 for Tregs. After 1, 2, 3, and 4 d of differentiation, CD4+ T cells were harvested for immunoblotting. (A) Phospho-Ser9-GSK3β, and phospho-Tyr276/Tyr219-GSK3α/β protein levels were analyzed by immunoblotting, as shown in representative blots from one of three independent experiments. Immunoblots were blotted for β-actin as a loading control. (B and D) Quantitative analyses of immunoblots from (A and C). (C) Phospho-Ser21-GSK3α, phospho-Thr308-Akt, total Akt, phospho-Ser380-p90Rsk, total p90Rsk, and phospho-Thr389-p70S6K protein levels were analyzed by immunoblotting, as shown in representative blots from one of three independent experiments. Immunoblots were blotted with β-actin as a loading control. We tested whether the production of Th1 or Th2 cells was dependent on GSK3, as was previously found for Th17 cells (10). GSK3 inhibitors and CD4+ T cells isolated from GSK3 knockin mice were used to test the effects of reducing and increasing GSK3 activity, respectively. 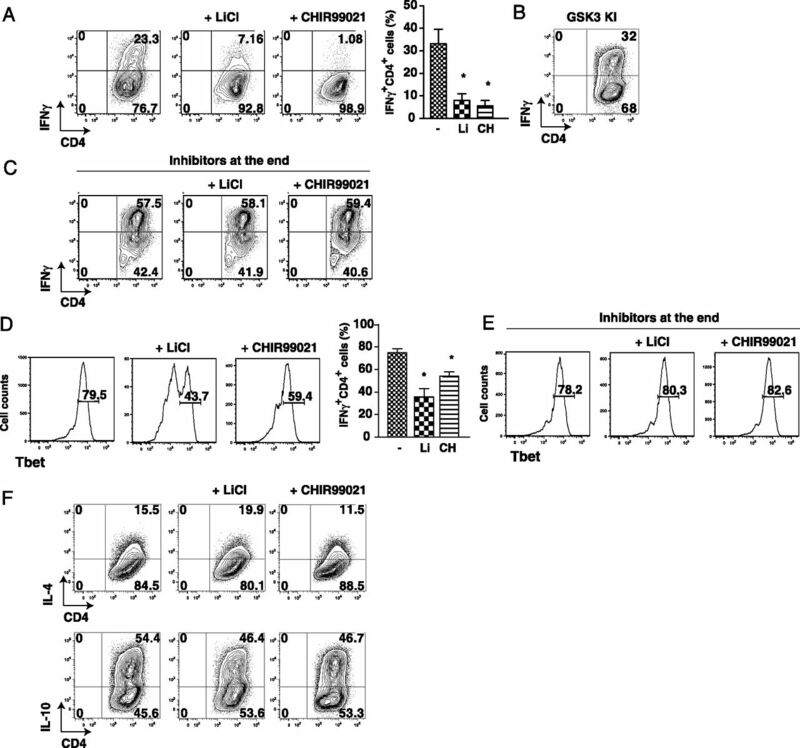 Polarization of CD4+ T cells toward IFN-γ–producing CD4+ T cells (Th1 cells) for 5 d was reduced by 66–75% after treatment with lithium, the most widely used GSK3 inhibitor (40, 41), or with the specific GSK3 inhibitor CHIR99021 (42, 43), as determined by flow cytometry after restimulation with PMA/ionomycin (Fig. 2A). GSK3 knockin mice (44) express GSK3α and GSK3β at normal levels, but with serine-to-alanine mutations at Ser21 in GSK3α and Ser9 in GSK3β to abrogate inhibitory serine phosphorylation of GSK3, the major mechanism for inhibition of GSK3 (13), so GSK3 is constitutively maximally active, but within its normal physiologic range. After Th1 polarization, CD4+ T cells from GSK3 knockin mice exhibited an increased percentage of IFN-γ–producing CD4+ T cells (Fig. 3B), compared with wild-type CD4+ T cells. After Th1 polarization, IFN-γ production was not reduced by treatment with GSK3 inhibitors CHIR99021 or lithium only during the 4 h restimulation with PMA/ionomycin after the 5 d of polarization (Fig. 3C), verifying that GSK3 promotes Th1 polarization rather than directly affecting IFN-γ synthesis by Th1 cells. We also evaluated Tbet, another Th1 marker that is expressed by other cells as well. The GSK3 inhibitors lithium and CHIR99021, added during the polarization toward Th1 cells for the 5 d of differentiation, also reduced Tbet expression (Fig. 3D), whereas during the last 4 h of the restimulation with ionomycin/PMA after the 5 d of differentiation, they were without effect on the level of Tbet (Fig. 3E), confirming that GSK3 promotes the differentiation of Th1 cells. GSK3 inhibitors reduce Th1 cell generation. CD4+ T cells were polarized toward Th1 cells for 4 d cultured on irradiated lymph node cells and splenocytes in medium supplemented with 10 ng/ml IL-12, 10 μg/ml anti–IL-4, and 2.5 μg/ml anti-CD3 with the GSK3 inhibitor 10 mM LiCl or 1 μM CHIR99021 (CH). Cells were washed, then stimulated for 4 h with PMA/ionomycin and brefeldin A, and flow cytometry was used to analyze IFN-γ–producing CD4+ T cells (A) from wild-type mice, (B) from GSK3 knockin mice, or (D) Tbet+ CD4+ T cells from wild-type mice. Flow cytometry analyses were quantified and expressed as mean ± SEM. n = 5–10. *p < 0.05, ANOVA. (C and E) CD4+ T cells were polarized toward Th1 cells for 4 d cultured on irradiated lymph node cells and splenocytes in medium supplemented with 10 ng/ml IL-12, 10 μg/ml anti–IL-4, and 2.5 μg/ml anti-CD3. Cells were washed, then stimulated for 4 h with PMA/ionomycin and brefeldin A with the GSK3 inhibitor 10 mM LiCl or 1 μM CHIR99021, and flow cytometry was used to analyze (C) IFN-γ–producing CD4+ T cells (n = 2) or (E) Tbet+ CD4+ T cells (n = 3). (F) CD4+ T cells were polarized toward Th1 cells for 4 d cultured on irradiated lymph node cells and splenocytes in medium supplemented with 1000 U/ml IL-4, 10 μg/ml anti–IL-12, 10 μg/ml anti–IFN-γ, and 2.5 μg/ml anti-CD3 with the GSK3 inhibitor 10 mM LiCl or 1 μM CHIR99021; and IL-4–producing CD4+ T cells or IL-10–producing CD4+ T cells were analyzed by flow cytometry. n = 3. In contrast to Th1 cell polarization, GSK3 inhibitors did not alter the polarization of CD4+ T cells toward Th2 cells after 5 d of stimulation with 100 U/ml IL-4. 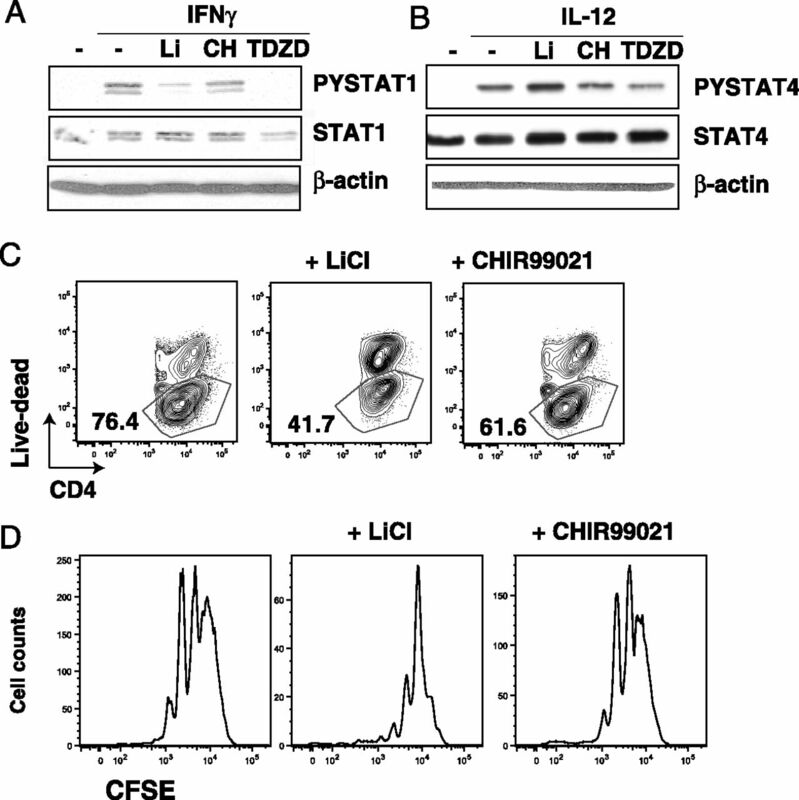 Treatment with lithium or CHIR99021 did not significantly alter the production of IL-4–producing or IL-10–producing Th2 cells (Fig. 3F). We next determined whether the dependence of Th1 cell production on GSK3 was associated with regulation of the transcription factors STAT1 and STAT4, which are key elements in the differentiation of Th1 cells, and whether either isoform of GSK3 was predominantly regulatory. In CD4+ T cells, IFN-γ–induced STAT1 activation by tyrosine phosphorylation was reduced by three inhibitors of GSK3 (Fig. 4A), whereas IL-12–induced activation of STAT4 was unaltered by GSK3 inhibitors (Fig. 4B), indicating that during polarization to Th1 cells GSK3 promotes STAT1 activation, as has been reported previously in RAW264.7 cells (45). Staining for live or dead cells after Th1 polarization indicated reductions in viability by GSK3 inhibitors (Fig. 4C) that were similar to the reduction in Tbet levels (Fig. 3C), indicating that the reduction of Tbet+ cells is due to reduced viability. This reduced viability was not associated with a change by GSK3 inhibitors of the number of cell divisions measured by CFSE staining (Fig. 4D). These results indicate that GSK3 is required for STAT1 activation in the Th1 differentiation process and that GSK3 inhibitors reduce viability of Th1 cells. GSK3 promotes STAT1 activation in Th1 cell differentiation. 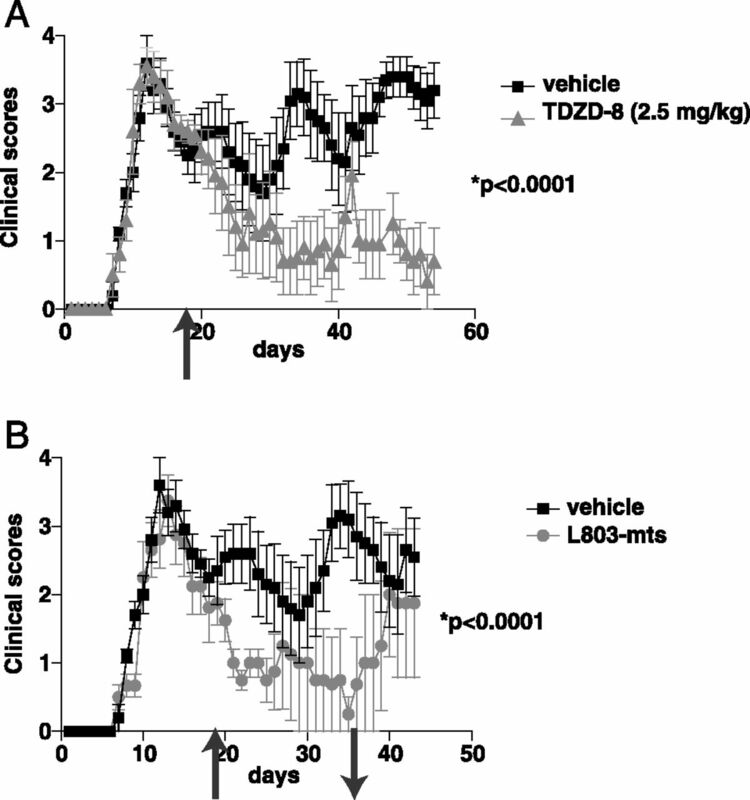 CD4+ T cells were stimulated with (A) 10 ng/ml IFN-γ or (B) 10 ng/ml IL-12, with the GSK3 inhibitor 10 mM LiCl, 1 μM CHIR99021, or 10 μM TDZD-8 for 30 min; and phospho-Tyr701-STAT1, total STAT1, phospho-Tyr694-STAT4, and total STAT4 were immunoblotted. Blots were reblotted for β-actin. n = 3. (C) CD4+ T cells were polarized toward Th1 cells for 4 d cultured on irradiated lymph node cells and splenocytes in medium supplemented with 10 ng/ml IL-12, 10 μg/ml anti–IL-4, and 2.5 μg/ml anti-CD3 with the GSK3 inhibitor 10 mM LiCl or 1 μM CHIR99021. Cells were washed, then stimulated for 4 h with PMA/ionomycin, and CD4+ T cells were analyzed for viability, using LIVE/DEAD staining by flow cytometry. n = 3. (D) CD4+ T cells were polarized toward Th1 cells for 3 d cultured on irradiated lymph node cells and splenocytes in medium supplemented with 10 ng/ml IL-12, 10 μg/ml anti–IL-4, and 2.5 μg/ml anti-CD3 with the GSK3 inhibitor 10 mM LiCl or 1 μM CHIR99021. Cells were washed, then stimulated for 4 h with PMA/ionomycin, and CD4+ T cells were analyzed for CFSE staining by flow cytometry gated on IFN-γ+ CD4+ T cells. n = 2. Because GSK3 inhibitors blocked IL-6–mediated Th17 polarization and because the balance between TGF-β and IL-6 determines the differential polarization toward Th17 or regulatory Tregs (46), we examined whether GSK3 inhibitors caused increased Treg polarization. However no difference was noted in the percentage of Foxp3+ CD4+ T cells after treatment with GSK3 inhibitors (Fig 5), suggesting that Tregs were not affected by GSK3 inhibitors. GSK3 inhibitors do not affect in vitro differentiation of Tregs. CD4+ T cells were polarized toward Tregs for 5 d with 5 ng/ml TGF-β, with or without GSK3 inhibitor 1 μM VP0.7, 1 μM VP2.51, 1 μM TDZD-8, or 4 μM L803-mts. Foxp3-expressing CD4+ T cells were analyzed by flow cytometry after 4 h of restimulation with ionomycin/PMA/brefeldin A. n = 3. To find out if GSK3 isoform–selective effects are present in the regulation of T cell subtype production, CD4+ T cells were isolated from transgenic mice. Knockouts of GSK3β are embryonically lethal (47); therefore, CD4+ T cells were isolated from GSK3α knockout mice and from GSK3β+/− heterozygote mice. Depletion of GSK3α significantly reduced the polarization of CD4+ T cells to Th1 cells, but did not alter the production of Th2 cells, Th17 cells, or Tregs (Fig. 6A). In contrast, reduction of GSK3β impaired the production of Th17 cells but did not significantly alter Th1, Th2, or Treg production (Fig. 6B). These results indicate that GSK3α and GSK3β may particularly promote the production of Th1 and Th17 cells, respectively, although both isoforms appear to contribute to both T cell subtypes because the GSK3 inhibitors had greater effects than did deletion of GSK3α or partial deletion of GSK3β. This conclusion was further verified by examination of the effects of GSK3 inhibitors on the production of Th cell subtypes from CD4+ T cells obtained from GSK3βFlox/Flox-CD4-CRE mice. The differentiation toward Th17 cells was significantly inhibited in GSK3βFlox/Flox-CD4-CRE CD4+ T cells compared with wild-type CD4+ T cells, whereas no difference was found in the differentiation toward Th1 cells or Tregs (Fig. 6C). GSK3 inhibitors further reduced the differentiation toward Th1 or Th17 cells in the CD4+ T cells isolated from GSK3βFlox/Flox-CD4-CRE mice, as well as wild-type CD4+ T cells, indicating both GSK3 isoforms contribute to T cell subtype production (Fig. 6C). GSK3 inhibitors did not alter viability (Fig. 6D) or proliferation (Fig. 6E) of CD4+ T cells from GSK3βFlox/Flox-CD4-CRE mice. 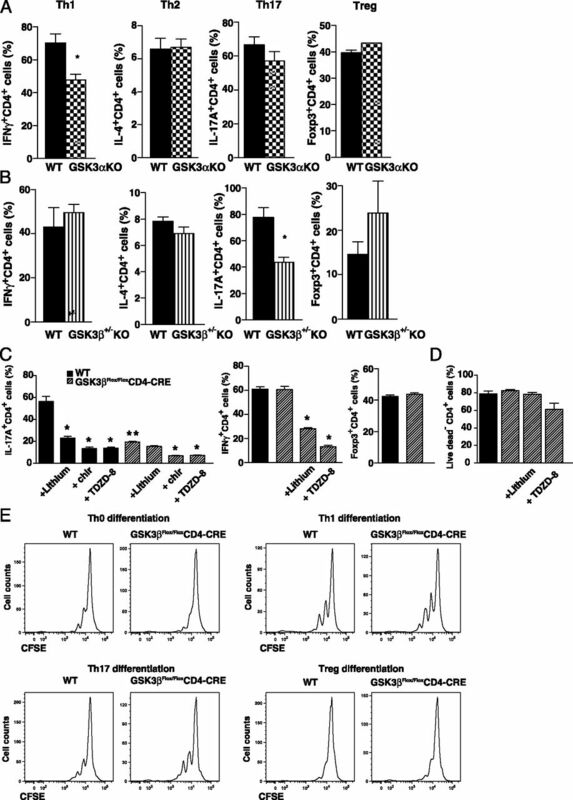 GSK3α promotes Th1 differentiation, whereas GSK3β promotes Th17 differentiation. CD4+ T cells isolated from (A) GSK3α knockout mice, (B) heterozygote GSK3β+/− knockout mice, and wild-type mice were cultured for 4 d on irradiated lymph node cells and splenocytes isolated from wild-type mice in medium supplemented with 10 ng/ml IL-12, 10 μg/ml anti–IL-4, and 2.5 μg/ml anti-CD3 for Th1 cells; with 1000 U/ml IL-4, 10 μg/ml anti–IL-12, 10 μg/ml anti–IFN-γ, and 2.5 μg/ml anti-CD3 for Th2 cells; with 20 ng/ml IL-6 and 5 ng/ml TGF-β, 10 μg/ml anti–IL-4, 10 μg/ml anti–IFN-γ, and 2.5 μg/ml anti-CD3 for Th17 cells; and with 5 ng/ml TGF-β, 10 μg/ml anti–IL-4, 10 μg/ml anti–IFN-γ, and 2.5 μg/ml anti-CD3 for Tregs. Cells were washed, then stimulated for 4 h with PMA/ionomycin, and CD4+ T cells were analyzed for IFN-γ for Th1 cells, IL-4 for Th2 cells, IL-17A for Th17 cells, and Foxp3 for Tregs, by flow cytometry. Cells were gated on CD4+ cells. Data are mean ± SEM. n = 3–5. *p < 0.05, t test. (C) CD4+ T cells isolated from GSK3βFlox/FloxCD4-CRE and from wild-type (GSK3βFlox/Flox, WT) mice were cultured for 4 d on irradiated lymph node cells and splenocytes isolated from wild-type mice in medium supplemented with 10 ng/ml IL-12, 10 μg/ml anti–IL-4, and 2.5 μg/ml anti-CD3 for Th1 cells; with 20 ng/ml IL-6 and 5 ng/ml TGF-β, 10 μg/ml anti–IL-4, 10 μg/ml anti–IFN-γ, and 2.5 μg/ml anti-CD3 for Th17 cells; and with 5 ng/ml TGF-β, 10 μg/ml anti–IL-4, 10 μg/ml anti–IFN-γ, and 2.5 μg/ml anti-CD3 for Tregs, with 10 mM LiCl, 1 μM CHIR99021 (chir), or 1 μM TDZD-8. Cells were washed, then stimulated for 4 h with PMA/ionomycin, and CD4+ T cells were analyzed for IL-17A for Th17 cells, for IFN-γ for Th1 cells, and for Foxp3 for Tregs, by flow cytometry. Cells were gated on CD4+ cells. Data are mean ± SEM. n = 6. *p < 0.05, comparing the effects of GSK3 inhibitors with those of matched cell type without inhibitor; **p < 0.05, comparing results from GSK3βFlox/Flox CD4-CRE CD4+ T cells with those from WT CD4+ T cells. ANOVA, Bonferroni post hoc test. (D) CD4+ T cells isolated from GSK3βFlox/Flox CD4-CRE, WT mice were cultured for 4 d on irradiated lymph node cells and splenocytes isolated from wild-type mice in medium supplemented with 20 ng/ml IL-6 and 5 ng/ml TGF-β, 10 μg/ml anti–IL-4, 10 μg/ml anti–IFN-γ, and 2.5 μg/ml anti-CD3 for Th17 cells, with 10 mM LiCl or 1 μM TDZD-8. Cells were washed, then stimulated for 4 h with PMA/ionomycin, and CD4+ T cells were analyzed for viability, using LIVE/DEAD dye by flow cytometry. Cells were gated on CD4+ cells. Data are mean ± SEM. n = 6. (E) CD4+ T cells isolated from GSK3βFlox/FloxCD4-CRE and from GSK3βFlox/Flox, WT mice were cultured for 4 d on irradiated lymph node cells and splenocytes isolated from wild-type mice in medium supplemented with 10 ng/ml IL-12, 10 μg/ml anti–IL-4, and 2.5 μg/ml anti-CD3 for Th1 cells; with 20 ng/ml IL-6 and 5 ng/ml TGF-β, 10 μg/ml anti–IL-4, 10 μg/ml anti–IFN-γ, and 2.5 μg/ml anti-CD3 for Th17 cells; and with 5 ng/ml TGF-β, 10 μg/ml anti–IL-4, 10 μg/ml anti–IFN-γ, and 2.5 μg/ml anti-CD3 for Tregs. Cells were washed, stimulated for 4 h with PMA/ionomycin, and CD4+ T cells were analyzed for CFSE staining by flow cytometry gated on CD4+ T cells. To discover whether EAE was affected by inhibition of GSK3, we tested four structurally and functionally diverse GSK3 inhibitors in MOG35–55-induced EAE. Mice were pretreated with inhibitors for 3 d, or 7 d for L803-mts, before immunization, and the inhibitor administration was continued throughout the evaluation of EAE. Administration of a low dose of the ATP-noncompetitive GSK3 inhibitor TDZD-8 (2.5 mg/kg) did not alter the onset of EAE clinical symptoms, but after onset mice recovered and the progressive stage of EAE evident in inhibitor-free mice was almost completely eliminated (Fig. 6A). Administration of a higher dose of TDZD-8 (5 mg/kg) both delayed onset and reduced severity of EAE (Fig. 7A). Administration of a low dose of the ATP-competitive GSK3 inhibitor VP2.51 (2.5 mg/kg) was ineffective (Fig. 7B), whereas after administration of 5 mg/kg of VP2.51, the onset of EAE was unaffected but mice quickly recovered and the progressive stage of EAE was nearly completely blocked (Fig. 7B). Administration of the allosteric GSK3 inhibitor VP0.7 (5 mg/kg) both delayed the onset and reduced the severity of EAE, although individual responses to this GSK3 inhibitor were the most varied among the inhibitors tested (Fig. 7C). Administration of the permeable peptide substrate-competitive GSK3 inhibitor L803-mts also eliminated the progressive stage of EAE, although the onset of clinical symptoms was unaffected (Fig. 7D). Thus, all GSK3 inhibitors were particularly effective in blocking the debilitating progressive stage of EAE, whereas the onset of clinical symptoms was variably diminished, and the results with TDZD-8 indicate that this was at least in part due to the doses of the inhibitors that were tested. Administration of GSK3 inhibitors reduces the severity of the progressive phase of EAE. 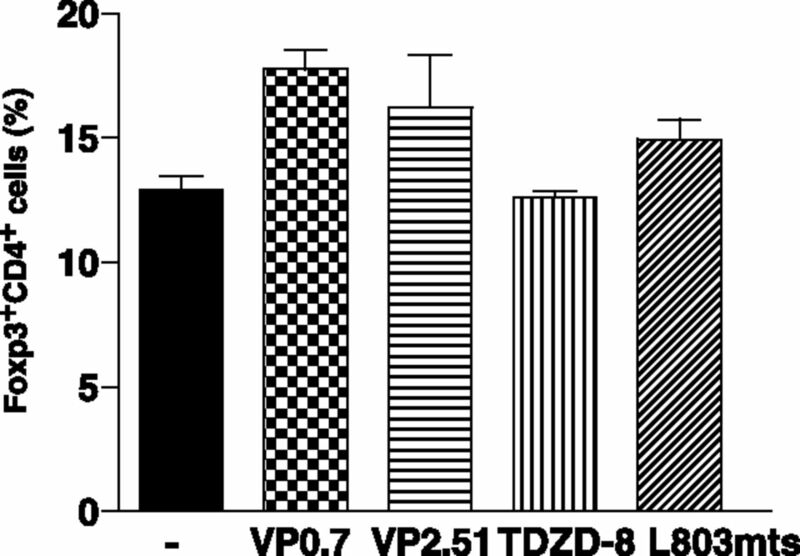 Mice were pretreated with (A) 2.5 or 5 mg/kg TDZD-8, (B) 2.5 or 5 mg/kg VP2.51, or (C) 5 mg/kg VP0.7, for 3 d prior to immunization with MOG35–55 peptide and daily throughout the experiment. (D) L803-mts (60 μg) was administered intranasally for 7 d before immunization, and after immunization 80 μg was given three times a week. Clinical symptoms were scored daily, and values shown are mean ± SEM. n = 4–5. Data represent one of two independent experiments. *p < 0.0001, t test. T cell subtypes were measured in the spinal cords of immunized mice treated with GSK3 inhibitors. The reduction of clinical scores in EAE mice treated with the GSK3 inhibitors was associated with a reduction of Th17 cells in the spinal cord, whereas Th1 cells, Tregs, CD4+ T cells, CD8+ T cells, activated microglia, macrophages, and dendritic cells were not affected (Supplemental Fig. 1). Relapsing-remitting disease is the most common form of MS, which is modeled in PLP139–151–immunized female SJL mice. In this model, an acute episode of EAE clinical symptoms occurred with a peak of disease severity 14 d after immunization, followed by remission and recurring fluctuating episodes (Fig. 8A). During remission, 19 d after immunization, mice were treated with a low dose of TDZD-8 (2.5 mg/kg), and daily TDZD-8 treatment was continued throughout the experiment. Whereas untreated mice displayed three relapse episodes of EAE clinical symptoms, the clinical scores of the TDZD-8–treated mice declined and only a single relapse of 2 d duration (days 41–42) occurred. Another group of mice treated with L803-mts (80 μg, intranasally, three times per week) beginning 19 d after immunization also displayed diminishing clinical symptoms of EAE up to 36 d post immunization (Fig. 8B). At that time, L803-mts treatment was terminated to see if EAE was cured or if clinical symptoms recurred. After withdrawal of L803-mts, mice displayed increasing severity of EAE that after 6 d reached clinical scores of mice that had never received a GSK3 inhibitor. Thus, even when administered after the first clinical episode of EAE, two mechanistically dissimilar specific GSK3 inhibitors effectively controlled the disease. Postdisease administration of GSK3 inhibitors reduces EAE severity. Treatment with (A) TDZD-8 (2.5 mg/kg i.p., daily) or with (B) L803-mts (80 μg intranasally, three times per week), initiated 19 d after PLP139–151 peptide immunization (see arrow ↑), during remission after the first clinical episode, significantly attenuated clinical scores in PLP-immunized EAE mice. Mean ± SEM. n = 5. *p < 0.0001, t test. (B) Mice subsequently withdrawn from L803-mts (see arrow ↓) rapidly relapsed to reach clinical scores comparable to those in mice never treated with a GSK3 inhibitor. Mean ± SEM. n = 4–5. Data represent one of two independent experiments. *p < 0.0001, t test. GSK3 inhibitors effectively produced beneficial effects in both MOG and PLP models of EAE, and the particularly effective reduction of symptoms of the progressive phase suggested an important action of GSK3 in the adaptive immune response. Therefore, we developed a new mouse model in which GSK3 was depleted only in T cells to determine if this was sufficient to protect mice from MOG-induced EAE. T cells deficient in GSK3β were generated by crossing GSK3βFlox/Flox mice and CD4-CRE mice, to obtain GSK3βFlox/Flox-CD4-CRE mice and their littermate control GSK3βFlox/Flox mice. After isolation of CD4+ T cells, Western blots confirmed that GSK3β expression was abolished in the CD4+ T cells from GSK3βFlox/Flox-CD4-CRE mice, whereas GSK3α expression was unchanged, indicating no compensatory upregulation of GSK3α in the absence of GSK3β (Fig. 9A). MOG35–55–induced EAE onset was delayed and the severity of EAE clinical symptoms was significantly reduced in the GSK3βFlox/Flox-CD4-CRE mice compared with their littermate controls (Fig. 9B). Examination of CD4+ T cells showed a reduction in the infiltration of CD4+ T cells (Fig. 9C) and the number of Th17 cells (Fig. 9D), Th1 cells (Fig. 9E), and Tregs (Fig. 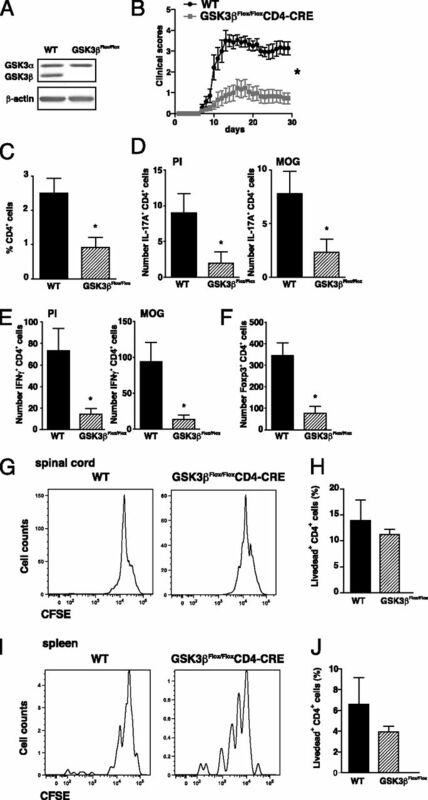 9F) in the spinal cord of GSK3βFlox/Flox-CD4-CRE mice compared with littermate controls. No impairments were found in cells from GSK3βFlox/Flox-CD4-CRE mice compared with wild-type mice in the proliferation (Fig. 9G) or viability (Fig. 9H) of spinal cord–infiltrated CD4+ T cells, or in the proliferation (Fig. 9I) or viability (Fig. 9J) of spleen CD4+ T cells restimulated with MOG35–55 peptide. Deletion of GSK3β in T cells is sufficient to reduce the severity of EAE. (A) Immunoblot of GSK3α and GSK3β levels in CD4+ T cells from GSK3βFlox/Flox-CD4-CRE (GSK3βFlox/Flox) mice and control littermate GSK3βFlox/Flox mice (WT). (B) Clinical scores of mice after immunization with MOG35–55 peptide. Mean ± SEM. n = 15. *p < 0.05, t test. Analysis of (C) CD4+ T cells, (D) Th17 cells, (E) Th1 cells, and (F) Tregs in the spinal cord of GSK3βFlox/Flox-CD4-CRE mice and control GSK3βFlox/Flox mice induced with EAE 30 d after immunization. Where indicated, cells were stimulated for 4 h with PMA/ionomycin (PI) or 10 ng/ml MOG35–55, and CD4+ T cells were analyzed for IFN-γ for Th1 cells, IL-17A for Th17 cells, and Foxp3 for Tregs, by flow cytometry. Cells were gated on CD4+ cells. Data are mean ± SEM. n = 7–8. *p < 0.05, t test. (G) Cells isolated from the spinal cord or (H) the CD4+ T cells from the spleen were stained with CFSE ex vivo, and 3 d later, cells were washed and restimulated for 4 h with 10 ng/ml MOG35–55. CFSE labeling was evaluated by flow cytometry. (I) Cells isolated from the spinal cord or (J) the CD4+ T cells from the spleen were cultured for 3 d, washed, and restimulated for 4 h with 10 ng/ml MOG35–55. Cells restimulated for 4 h with 10 ng/ml MOG35–55 were analyzed for viability, using LIVE/DEAD dye by flow cytometry. Cells were gated on CD4+ cells. MS afflicts >2 million people, and its causes are still unclear. No known cure exists for MS, and many current therapies cause significant side effects. Thus, new drug targets are critically needed for therapeutic development and for better understanding of disease mechanisms. Recent findings indicate that GSK3 is a strong candidate target for therapeutic development. GSK3 promotes inflammation (17), the production of Th17 cells (10), several neurodegenerative diseases and neuronal apoptosis induced by many insults (14), and impairs myelination (15). Any one of these actions could make GSK3 a reasonable therapeutic target for MS, so together these actions provide an exceptionally strong rationale for assessing the effects of GSK3 inhibitors in EAE. Previously, we reported that the GSK3 inhibitor lithium is remarkably effective in controlling EAE (10, 11), but because lithium has other targets it remained to be determined whether inhibiting GSK3 is sufficient to alleviate EAE. The present study demonstrates that inhibition of GSK3 reduces Th1 cells, as well as Th17 cells, which are thought to be two of the main pathologic T cell subtypes in MS and EAE, and alleviates symptoms of EAE. All four of the mechanistically distinct, structurally diverse, small molecule inhibitors of GSK3 that were tested significantly reduced the severity of EAE. Remarkably, all of the GSK3 inhibitors were most effective in diminishing the severity of the chronic phase of EAE, which models the debilitating progressive stage of MS. Many drugs delay the onset of EAE, but few preferentially block the progressive phase, the most difficult phase of MS to control and the critical stage causing neurologic disability. The dose-dependent effects of TDZD-8 are particularly informative. The lower dose of TDZD-8 (2.5 mg/kg) had little effect on the onset of clinical symptoms, but significantly diminished the severity of the progressive phase of EAE, whereas the higher dose of TDZD-8 (5 mg/kg) reduced both onset and progression. The results with TDZD-8 indicate that this difference in sensitivities of the two stages is a dose-dependent effect, with moderation of progressive EAE requiring less inhibition of GSK3 than the onset of EAE. This difference could be advantageous in the clinical use of GSK3 inhibitors by allowing effective use of low doses of the drugs for the progressive stage of MS. GSK3 is ubiquitously expressed in all cell types, and as discussed previously (48), complete inhibition of GSK3 is not a realistic clinical goal because of the potential for toxicity owing to the many actions of GSK3. Thus, the effectiveness of a low dose of TDZD-8 demonstrates that partial inhibition of GSK3 is adequate for lessening the severity of the progressive stage of EAE. This conclusion is in accordance with the results of lithium administration, which effectively controlled EAE at therapeutic levels of lithium (< 1 mM) that only partially inhibit GSK3 (40, 41). Moreover, the results with T cell depletion of GSK3β further indicate that only partial reduction of GSK3 is sufficient to alleviate EAE and that GSK3 inhibitors need not penetrate the CNS for therapeutic effects. Also important is the finding that GSK3 inhibitors are effective in relapsing-remitting EAE even when administered after the initial clinical episode of the disease. This protocol is more challenging than pretreatment in obtaining therapeutic effects because the disease has already been established and induced damage, but is more relevant for modeling clinical applications. After administration following an initial episode of relapsing-remitting EAE, both TDZD-8 and L803-mts greatly reduced further episodes and evolution to the progressive phase. TDZD-8 was shown to be effective for at least 35 d in this model, indicating that GSK3 inhibition can provide long-term protection. Postimmunization treatment with L803-mts also was effective in diminishing further disease episodes. To test whether the disease was “cured,” L803-mts administration was terminated after mice had displayed low severity of EAE for 16 d. These mice rapidly deteriorated to reach clinical scores of mice that had never received a GSK3 inhibitor after only 5 d. This response is equivalent to the disease rebound that we previously observed following withdrawal of lithium from EAE mice (10, 11). Thus, GSK3 inhibition is effective in alleviating EAE, but drug administration must be continued to avoid re-emergence of disease. Effective control of the chronic progressive stage of EAE suggests that one critical action of GSK3 in EAE involves reducing the pathologic effects of T cells that are thought to be important mediators of this stage (2). This idea is further supported by the finding that selectively reducing GSK3β in T cells effectively reduced EAE severity, directly demonstrating that controlling T cell GSK3 activity is sufficient to obtain therapeutic effects in EAE. This conclusion correlates well with findings that GSK3 inhibitors reduce Th17 and Th1 cells, T cells that have been implicated as important contributors to the pathologic features of EAE and MS, whereas Th2 cells and Tregs were independent of GSK3 regulation. Previously, we reported that inhibition of GSK3 severely restricts the production of Th17 cells in vitro and in vivo, apparently owing to reduced IL-6 production and STAT3 activation, two requisites for Th17 cell production. However, no information was available concerning whether either of the two GSK3 isoforms preferentially mediate the regulation of T cells. GSK3α and GSK3β are highly homologous isoforms that phosphorylate many of the same substrates and are both inhibited by all available GSK3 inhibitors (49). However, molecular approaches have allowed an increasing number of GSK3 isoform-selective actions to be identified in recent years (49, 50). Th17 cell production appears to be particularly linked to GSK3β, as GSK3β expression and protein levels are highly upregulated upon differentiation of CD4+ T cells to Th17 cells, and GSK3β deficiency in CD4+ T cells from GSK3β+/− heterozygote mice substantially impaired the production of Th17 cells, whereas GSK3α deficiency did not. In addition, GSK3α was recently found to selectively modulate IL-1–mediated regulation of Th17 cells (51). GSK3α deficiency enhanced Th17 cell proliferation and maintenance induced by IL-1, but IL-2 responses were independent of GSK3α. GSK3α deficiency did not alter the differentiation of naive T cells to Th17 cells induced by IL-6 plus TGFβ, but, rather, enhanced Th17 cell production stimulated by IL-1. Conversely, expression of constitutively active GSK3α did not alter the differentiation of naive T cells to Th17 cells induced by IL-6 plus TGFβ, but, rather, impaired Th17 cell production stimulated by IL-1. Altogether, these findings demonstrate that the stimulatory effect of IL-1 on Th17 cells is suppressed by GSK3α, an action attributed to inhibition by GSK3α of IL-1–induced activation of Akt and mTOR (51). Furthermore, adoptive transfer of GSK3α-deficient MOG35–55–specific Th17 cells induced EAE with an earlier onset and greater severity than transfer of wild-type MOG35–55–specific Th17 cells in recipient mice, which correlated with increased proliferation of Th17 cells induced by IL-1 in GSK3α-deficient cells (51). Thus, GSK3α has a selective regulatory effect on the influence of IL-1, but not other cytokines, on Th17 cells. Th1 cells demonstrated an interesting difference from Th17 cells, as the production of Th1 cells was significantly reduced by depletion of GSK3α, but not by reduction of GSK3β, although the levels of GSK3β, but not of GSK3α, increased upon polarization of CD4+ T cells to Th1 cells. However, the results with Th1 cells may reflect the total expression levels of GSK3α and GSK3β in CD4+ T cells, as GSK3α is the predominantly expressed isoform, so knocking out GSK3α has a much more significant effect on lowering total GSK3 in CD4+ T cells than does a 50% reduction of GSK3β. Thus, whereas Th17 cells appear to be preferentially dependent on GSK3β, Th1 cells may be dependent on the total amount of GSK3 available. This GSK3 dependency in Th1 cells appears to be due to the regulation of STAT1 and Tbet, which are critical for the differentiation toward Th1 cells. Consistent with a previous report showing in macrophages that GSK3 promotes IFN-γ production (17), GSK3 also controls Th1 differentiation by modulating IFN-γ production. However, addition of GSK3 inhibitors during restimulation with ionomycin/PMA after Th1 cell differentiation did not affect IFN-γ production, suggesting that GSK3α acts early in the differentiation of Th1 cells. These GSK3 isoform–selective actions suggest that selective inhibitors of GSK3α or GSK3β may provide new therapeutic strategies for autoimmune diseases by allowing selective, but not absolute, targeting of Th1 and Th17. There is a rapidly growing recognition that GSK3 has important actions in the innate and adaptive immune systems and that it may provide a therapeutic target in immune system–mediated diseases (12)—for example to reduce inflammation (17) or the production of deleterious Th17 cells (10). Because GSK3 has several actions in the immune and nervous systems that are linked to EAE and MS, multiple changed responses may underlie the therapeutic actions of GSK3 inhibitors in EAE. Likely contributing to this are the anti-inflammatory effects of inhibiting GSK3, as well as the regulation of pathogenic T cell populations. In this article, we demonstrated that specific GSK3 inhibitors alleviate the clinical symptoms of EAE, and that they are particularly effective in the debilitating progressive phase of the disease, further supporting their potential therapeutic application in MS.
We thank Dr. D. Alessi for providing the GSK3 knockin mice and Robert L. Kress for technical assistance. This work was supported by grants from the National Institute of Mental Health (MH038752, MH090236, and MH095380) and by Canadian Institutes of Health Research Grant MOP 74711 (to J.R.W.). 2004. Multiple sclerosis. J. Clin. Invest. 113: 788–794.
. 2012. Multiple sclerosis: new insights in pathogenesis and novel therapeutics. Annu. Rev. Med. 63: 389–404.
. 2011. Treatment of multiple sclerosis: current concepts and future perspectives. J. Neurol. 258: 1747–1762.
. 2011. A critical appraisal of treatment decisions in multiple sclerosis—old versus new. Nat Rev Neurol 7: 255–262.
. 2011. Experimental autoimmune encephalomyelitis (EAE) as a model for multiple sclerosis (MS). Br. J. Pharmacol. 164: 1079–1106.
. 2010. Translational research in neurology and neuroscience 2010: multiple sclerosis. Arch. Neurol. 67: 1307–1315.
. 1994. High incidence of spontaneous autoimmune encephalomyelitis in immunodeficient anti-myelin basic protein T cell receptor transgenic mice. Cell 78: 399–408.
. 2006. Anti-IL-23 therapy inhibits multiple inflammatory pathways and ameliorates autoimmune encephalomyelitis. J. Clin. Invest. 116: 1317–1326.
. 2000. Anti-IL-12 antibody prevents the development and progression of multiple sclerosis-like relapsing—remitting demyelinating disease in NOD mice induced with myelin oligodendrocyte glycoprotein peptide. J. Neuroimmunol. 102: 56–66.
. 2008. Lithium prevents and ameliorates experimental autoimmune encephalomyelitis. J. Immunol. 181: 338–345.
. 2004. The glamour and gloom of glycogen synthase kinase-3. Trends Biochem. Sci. 29: 95–102.
. 2006. The paradoxical pro- and anti-apoptotic actions of GSK3 in the intrinsic and extrinsic apoptosis signaling pathways. Prog. Neurobiol. 79: 173–189.
. 2011. GSK3β negatively regulates oligodendrocyte differentiation and myelination in vivo. Glia 59: 540–553.
. 2012. Lithium toxicity profile: a systematic review and meta-analysis. Lancet 379: 721–728.
. 2002. First non-ATP competitive glycogen synthase kinase 3 beta (GSK-3beta) inhibitors: thiadiazolidinones (TDZD) as potential drugs for the treatment of Alzheimer’s disease. J. Med. Chem. 45: 1292–1299.
. 2009. Insulin reduces cerebral ischemia/reperfusion injury in the hippocampus of diabetic rats: a role for glycogen synthase kinase-3beta. Diabetes 58: 235–242.
. 2008. Treatment with the glycogen synthase kinase-3beta inhibitor, TDZD-8, affects transient cerebral ischemia/reperfusion injury in the rat hippocampus. Shock 30: 299–307.
. 2006. Glycogen synthase kinase-3 β inhibition reduces secondary damage in experimental spinal cord trauma. J. Pharmacol. Exp. Ther. 318: 79–89.
. 2006. Glycogen synthase kinase-3beta inhibitors protect against the organ injury and dysfunction caused by hemorrhage and resuscitation. Shock 25: 485–491.
. 2005. GSK-3β inhibitors attenuate the organ injury/dysfunction caused by endotoxemia in the rat. Crit. Care Med. 33: 1903–1912.
. 2011. Evidence for antimanic efficacy of glycogen synthase kinase-3 (GSK3) inhibitors in a strain-specific model of acute mania. Int. J. Neuropsychopharmacol. 14: 1051–1067.
. 2012. Synergistic interactions between PDE4B and GSK-3: DISC1 mutant mice. Neuropharmacology 62: 1252–1262.
. 2011. Genetic and pharmacological evidence for schizophrenia-related Disc1 interaction with GSK-3. Synapse 65: 234–248.
. 2011. Glycogen synthase kinase 3 inhibitors in the next horizon for Alzheimer’s disease treatment. Int. J. Alzheimers Dis. 2011: 280502.
. 2004. Rapid antidepressive-like activity of specific glycogen synthase kinase-3 inhibitor and its effect on beta-catenin in mouse hippocampus. Biol. Psychiatry 55: 781–784.
. 2009. Lithium increases synapse formation between hippocampal neurons by depleting phosphoinositides. Mol. Pharmacol. 75: 1021–1030.
. 2011. Elucidating substrate and inhibitor binding sites on the surface of GSK-3β and the refinement of a competitive inhibitor. J. Mol. Biol. 408: 366–378.
. 2007. Role of glycogen synthase kinase-3beta in early depressive behavior induced by mild traumatic brain injury. Mol. Cell. Neurosci. 34: 571–577.
. 2006. Long-term treatment with novel glycogen synthase kinase-3 inhibitor improves glucose homeostasis in ob/ob mice: molecular characterization in liver and muscle. J. Pharmacol. Exp. Ther. 316: 17–24.
. 2008. STAT3 sensitizes insulin signaling by negatively regulating glycogen synthase kinase-3 beta. Diabetes 57: 1227–1235.
. 2012. Glycogen synthase kinase 3 inhibition promotes adult hippocampal neurogenesis in vitro and in vivo. Chem Neurosci. 3: 963–971.
. 2011. Exploring the binding sites of glycogen synthase kinase 3. Identification and characterization of allosteric modulation cavities. J. Med. Chem. 54: 8461–8470.
. 2008. Tissue-specific role of glycogen synthase kinase 3beta in glucose homeostasis and insulin action. Mol. Cell. Biol. 28: 6314–6328.
. 2011. Tissue-specific analysis of glycogen synthase kinase-3α (GSK-3α) in glucose metabolism: effect of strain variation. PLoS ONE 6: e15845.
. 1996. A molecular mechanism for the effect of lithium on development. Proc. Natl. Acad. Sci. USA 93: 8455–8459.
. 1996. Lithium inhibits glycogen synthase kinase-3 activity and mimics wingless signalling in intact cells. Curr. Biol. 6: 1664–1668.
. 2004. Discovery and development of GSK3 inhibitors for the treatment of type 2 diabetes. Curr. Pharm. Des. 10: 1105–1137.
. 2005. Role that phosphorylation of GSK3 plays in insulin and Wnt signalling defined by knockin analysis. EMBO J. 24: 1571–1583.
. 2009. Glycogen synthase kinase-3β facilitates IFN-γ-induced STAT1 activation by regulating Src homology-2 domain-containing phosphatase 2. J. Immunol. 183: 856–864.
. 2011. GSK-3 inhibitors: preclinical and clinical focus on CNS. Front Mol Neurosci 4: 32.
. 2009. Unique and overlapping functions of GSK-3 isoforms in cell differentiation and proliferation and cardiovascular development. J. Biol. Chem. 284: 9643–9647.
. 2011. GSK-3: Functional insights from cell biology and animal models. Front Mol Neurosci 4: 40.
. 2012. Inactivation of the enzyme GSK3α by the kinase IKKi promotes AKT-mTOR signaling pathway that mediates interleukin-1-induced Th17 cell maintenance. Immunity 37: 800–812.